Sarasota Jungle Gardens: Reptiles, mammals and birds, oh my! A number of blue and red macaws call Jungle Gardens home. In Sarasota lies a 10-acre oasis of breathtaking landscape, home to myriad of rare and beautiful creatures that serve as an extraordinary, if only temporary, escape from civilization. Sarasota Jungle Gardens has been a family-owned sanctuary since its establishment in 1939, and now exhibits more than 150 native and exotic animals, most of them donated or rescued. Among them, birds of prey, primates, and even Florida’s famous flamingo. The gardens intermix education with entertainment through daily bird and reptile shows, featuring not just an array of exotic animals but a staff of impressive degree-backed keepers as well. 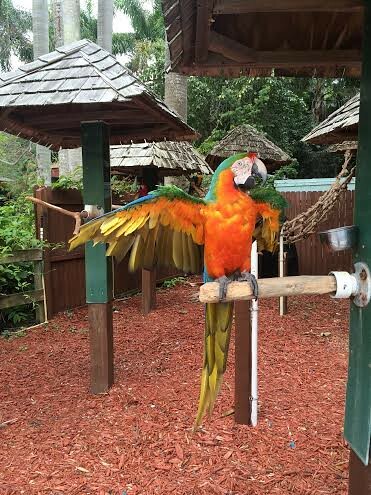 “A couple of the birds have been here since we started the show in the 70s and have been in that show since then,” commented Samantha Roman, keeper from the Florida International Teaching Zoo. “A lot of our birds of prey were injured, and because they couldn’t be released they came here, so a lot of them are rescue,” about 40 birds out of the jungle’s 50, Roman explained. Sarasota Jungle Gardens is an untamed adventure not to be missed by any New College student or Sarasota resident. The gardens, located at 3701 Bay Shore Road, are open daily from 10 a.m. to 5 p.m., and require a $15.99 donation for one adult entry. They do not currently offer student discounts but coupons can be found online. For more information call 941-355-1112 or visit http://www.sarasotajunglegardens.com/.